ANNUAL CONFERENCE 2014 IS OPEN FOR REGISTRATION! Do you like UPF:s lectures? If you like our lectures you’ll SURELY like this…! 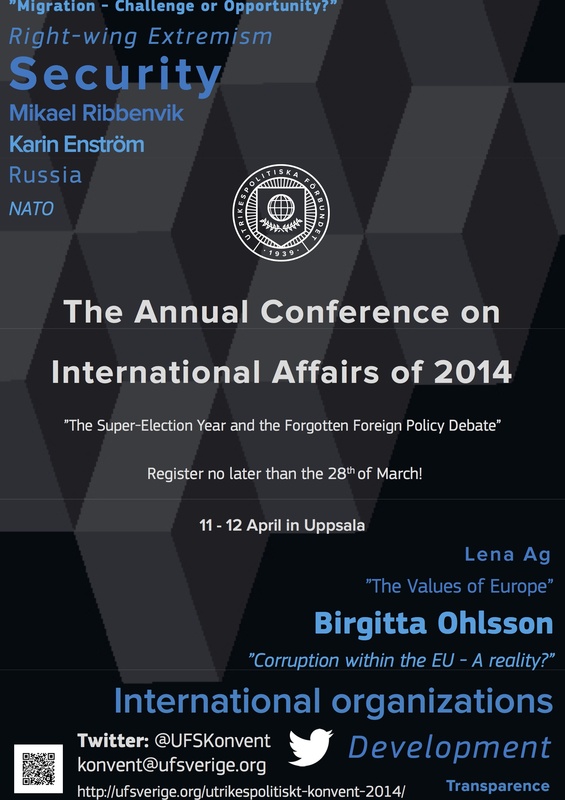 The Annual Conference on International Affairs is hosted by UFS/SAIA, which is a confederation that consists in 10 Associations of International Affairs (alike UPF Umeå) all over the country. There will be lectures, seminars and workshops for two full days with lots of possibilities to meet and greet with fellow foreign policy-nerds and on Saturday evening there will be a much appreciated banquet- usually a great and well planned dinner and party where you dress your finest and shake your stuff in them. Travel: We will travel as a group from Umeå (most likely we’ll arrive in Uppsala Friday morning and depart again on Sunday evening) so you’ll “never walk alone”- a whole group from Umeå will be with you. Due to a strained project budget we will be able to send 15 persons, first come first served, so register NOW! **NOTE** When you register, make sure that you’ve marked that you’re a member of UPF Umeå! Also, when you’ve registered – please send an e-mail to umea.ufsverige@gmail.com so you won’t get lost in the central administration.